Last year (2011) December, we had a cake baking contest in our Community Association function for the Christmas program. My friend called me and asked me to participate in the contest. She asked me only because there was no one who registered for baking and want someone to at least participate. I had no experience in decorating cakes, but she asked me to participate for fun. I had bought some Wilton cake decorating items few years ago, but never used it and it was a great oppurtunity for me to use it. So I registered for the contest knowing that I will not win by any means, but wanted to try something for fun. Not sure why I decided to go for a 2 tiered cake, spent 2 hrs on setting it up which ended up like a Pisa Tower leaning to fall any time. On the way to the program hubby cracked a joke 'Don't get disappointed if you win the prize for the worst cake'. We all laughed at his joke. OK, long story short, I ended up with lots of items I bought for making that cake and decided to make cake for my daughter's birthday with the left over chocolates and other baking items and there starts my birthday cake baking experiments. It was for my elder son Nathan's first birthday we ordered a chocolate mousse cake from a local bakery. The chocolate mousse cake from this bakery is very popular and we kept buying this for his birthday every year as it was a big hit among friends and family. 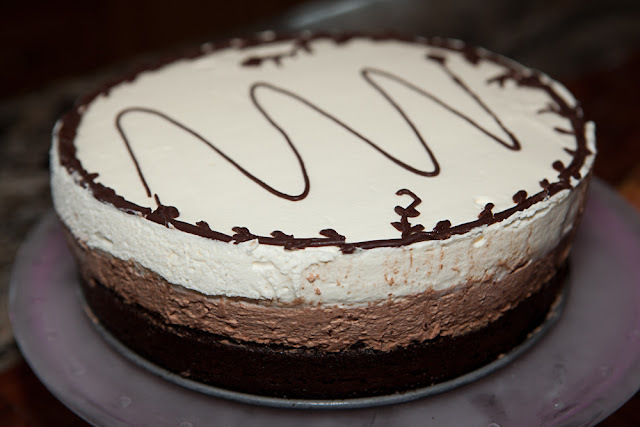 I never had a premonition of making my own chocolate mousse cake till this year for my little ones (Noah) birthday. It sure looked tedious and obscure to me. Chocolate flavor is well received by kids, so I asked my little one if he is OK with a 3 layered cake that has lots of chocolate. I am sure he didn't understand half of what I said, but he agreed and he wanted a Spiderman on it. Oh boy! I am dead, I know I don't have that expertise but was determined to go with this cake and thought to come up with something for decoration and convince him later. I ended up doing some chocolate designs, not Spiderman for sure, but he was happy as he loved the mousse part the best. I had made this cake quite a few times now for gatherings and it definitely proved to be a crowd pleaser. The pictures posted are from the cake I made for Noah's birthday. I never got a chance to take pictures of the triple chocloate mousse cake I made for other occasions, so I ended up with my first triple chocolate mousse cake pictures. So the step by step pictures are not there for assistance. It might seem little time consuming at the first approach, but on a closer look on individual steps it is just some whipping, layering and freezing. I know I might have intimidated you little bit, but the steps are fairly easy and the end result is a WOW factor dessert!!! So give it a try, it's a no fail dessert. To save some time, I had used boxed cake mix for the chocolate cake layer. Make sure you read the recipe to the end before you start. Bake the cake according to the package direction and let it cool completely in a 9 inch springform pan. Use a turn table or place the cake on a clean cutting board and cut the bulged top part out evenly using a serrated knife. Don't worry if it is not leveled, bcoz we are going to add layers to it by flipping the cake. Gently flip the cake and place it back into the springform pan, so that the top is now leveled. Bloom (dissolve) 1 tsp of gelatin in 2 tbsp of water in a small bowl and keep it aside. Heat the 1/2 cup heavy cream to a simmer in a sauce pan and when you notice it just starts to boil, bubbles appearing on the sides, turn it off and move the sauce pan from the hot stove and add the gelatin from previous step into it. It will dissolve completely in the hot cream. In a bowl take the chopped dark chocolate and pour the hot cream over it and mix with a spoon till the whole chocolate dissolves. Keep it aside to cool. whip 30 secs and stop. Fold in the whipped cream into the melted chocolate and mix gently so that it is mixed well and you don't see any more dark chocolate layer. Be gentle when you do this step as it can break down the air bubbles in the whipped cream and liquefy the mix. Repeat the same steps as in the dark chocolate mousse with white chocolate to prepare the white chocolate mousse just after the dark chocolate mousse layer is set. Grease the sides of the springform pan with butter or cooking spray that already got the cake as the bottom layer. You can also line the pan with parchment paper so that it can be released easily when it is set. 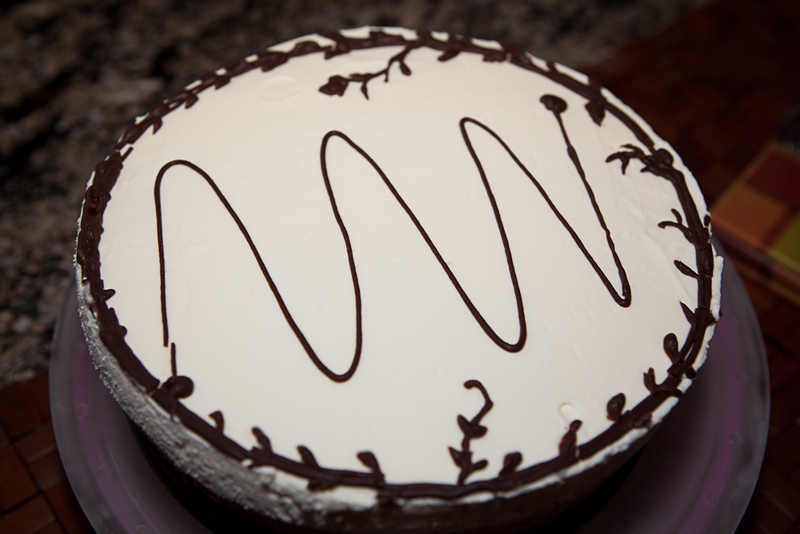 Pour the chocolate mousse over the cake layer and level it with a spatula. Cover the springform pan with a lid/plate and put it in the freezer for 20 mins. Repeat the same process with white chocolate over the dark chocolate mousse to make the white chocolate mousse layer and freeze it for 20 minutes. You can refrigerate it (covered) after the mousse is set. Decorate it as you like. I used melted (using double boiler - refer notes) chocolate and corn syrup just to sweeten it little more and used a piping bag to create some designs. Before taking it out of the springform pan, take a sharp knife and dip it in hot water for 30 seconds and run it around the cake in the pan, this will help the cake to release easily without cracking when you open the spingform pan. Try to use a springform pan to bake this cake, so that the cake can be released and the layers can be visible. Double boiler melting - melt the chocolate by placing it in a bowl over a sauce pan of boiling water. Keep the cake refrigerated till ready to use. Thanks! This is one of my favorite cakes. Thanks for the sweet comment!!! This has become my family's favorite cake and I love it very much. Do try it. Since there were only few of us who participated on the contest, we all won on each category. I had made a dove on top of the cake and it won for the theme. I feel horrible when I think about that cake now. All other cakes were far better than mine though :). But it was a great experience. Hi Shibi! What a wonderful looking cake and sure looks delicious! great great cake dessert, Shibi !